Borne from the struggle to keep acoustic Irish music alive and relevant, Victims of Irish Music gathers the finest independent Celtic musicians who are winning the fight to keep instrumental Irish and Celtic music vibrant and meaningful. The Irish & Celtic Music Podcast is a free, bi-monthly, downloadable radio show of independent Irish and Celtic music. It is hosted by Marc Gunn, lead singer of the Brobdingnagian Bards and The Dubliners Tabby Cats, chief editor of the Celtic MP3s Music Magazine, proprietor of Song Henge, and a fan of all things Celtic. If you're looking for Celtic MP3s or music online, Marc Gunn is probably there. ORIGINS OF "VICTIMS OF IRISH MUSIC"
Last year, I borrowed a book from harper, Doc Grauzer, for casual reading about the history of Irish music. In the book, the author explained that many Irish musicians were forbidden by Britain to play the music of their heritage and suffered the consequences for disobeying. But the concept seemed to have greater depth to me as an independent Celtic musician. Music has evolved a lot since those days. Styles have changed. Dylan went electric. Enya changed the whole concept of "Celtic music" to many in the United States. While I enjoy all styles of Irish and Celtic music, I feel that in order to know where you are going, you should know where you came from. Our cultural heritage is important, as is our musical heritage. This album includes a wide range of acoustic instrumental music. It is not all traditional, but it is an exciting glimpse at how 21st century independent Celtic musicians are keeping tabs on their cultural heritage. It covers a wide range of musical styles by bands who refuse to allow their heritage to be victimized. If you are love your Irish heritage, you can show your love of it with this captivating and energizing compilation of amazing music. A portion of the profits benefit a non-profit cultural organization, but all of it supports the heart of our Irish heritage. 12. "Congress Reel" by Poitin from Live! Other than that, run don't walk to the computer to order two copies of this album. One for yourself and one to share. It will make a worthy addition whether it's your first album of Irish music or one more to add to your collection -- it will become your favorite after one listen. Hurry! Become a 'Victim of Irish Music'. Good choice of traditional music in thraditional castume. Felt like I was again strolling the hills of Donegal. I always loved traditional Irish music. This CD brings out the best instrumentals in that style. Good for all occasions: to have a great background music or to listen at. 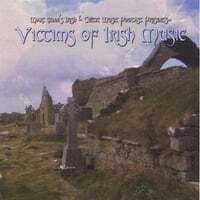 If you like the CD, please check out the Irish and Celtic Music Podcast as well. If you like that podcast ... get this CD. I really enjoyed this album. There was a good variety of styles found on it while all with in the Celtic style. I enjoyed how it covered them. There weren’t any songs I thought were subpar songs. This is over all a very good album. brought as a gift for my mum who loves it.please please do some more. xmas will soon be here and i would love to buy her some more, would make my shopping so easy. This is an excellent compilation of instrumental Irish music! It kept my toes tapping the entire time I listened, made me want to try and dance a jig. I recommend this album to absolutely everyone who likes a spirited tune. If love it too, I highly recommend buying this album. It has a great mix of toe-tapping tunes that make you want to get up and dance. Great CD! Just in time for St. Patty's! Good thing this CD came out in time for St. Patty's! All instrumental, and all top quality Celtic tunes - and just like your favourite beverage of choice - excellent to share with the company of good friends. Spread the word - this pub mix is a must for any Celtic music enthusist. Rollicking fiddles, earthy bohrans and whimsical flutes wait to inspire and invigorate! Bonus points: if you think you've heard Celtic Stone's "Rocky Road To Brenham" somewhere else, listen to Great Big Sea's "Dancing With Mrs. White" and pour another round! Slainte! WOW! I want to dance. This CD is fantastic. I really don't like pure acoustic Irish music. Usually its full of sappy, slow stuff that just doesn't do it for me. Every song on this compilation makes me want to dance. Cheers to Marc Gunn for putting it together!